MagicDuel, The adventure you will never forget. MagicDuel is a unique fantasy game unlike anything you played before. We call it a "game" because anyone can join free and PLAY it, but MD is much more than a simple casual game. MagicDuel consists of a community of amazing people, players that build a virtual society, create their own quests and become friends ..or foes. I would like to say that there are lots and lots of players, but there are just a couple of hundred that stay, many more that come and go daily because MD is not the casual browser game kind you are used to. Regardless of you play it for fun from time to time or you end up with actual years of daily activity and rule your own land, if you manage to become part of this community, MD will be an adventure you will not forget. 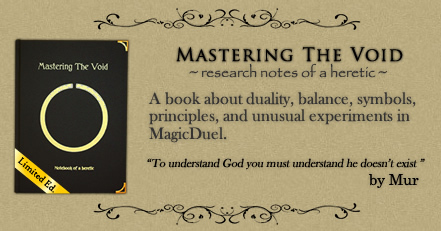 MagicDuel is not something for anybody to master, but for everybody to experience. Now, take a part of your true identity and turn it in a MD Character, what are you waiting for? As a new player you can raise creatures, upgrade them several levels, discover hundreds of beautifull hand-drawn landscapes, experience hard to believe magical items, compete and fight, adventure into captivating quests and much much more. As days pass by you will get deeper and deeper into the community and MagicDuel will mean much more than a nice game with beautifull artworks. You will learn how to understand people, you will learn to negociate and obtain, to use your words as a weapon, to appreciate and make friends, to hate, to create but also to destroy... to express those parts of your self that can not be normally expressed. Players can shape the game world with their actions, the game only has a beginning, but not an end. Daily updates and announcements keep things entertaining and alive. Tags: Fantasy role-playing games, browser mmorpg game, free multiplayer adventure.